Last month, data tracking companies IDC and Gartner both reported that PC sales were in grave decline as consumers migrated towards competing devices, particularly tablets and smartphones. While these smaller and more portable devices used to drive only a small percentage of a typical website’s traffic, today they are rapidly becoming consumers’ primary devices for web access. As times and habits change, so should your website. Rather than dealing with the headache of developing and operating a separate mobile website, business owners should make their main websites “responsive” to these newer and smaller devices. What is “responsive web design”? It is a concept where designers create a website that is adaptable to all different types of devices, including desktop computers, mobile phones, and tablet computers. The goal of responsive web design is to make your website easily readable and navigable in any situation on any device. By doing so, you vastly improve the user experience and stave off the risk of losing traffic, sales, and your online reputation. With such a fast shift towards non-PC devices, making your website design responsive is more important than ever. The problem is that many older websites are built on static wireframes where content doesn’t move when you increase or decrease screen size. In order to be responsive, website content needs to sit on a fluid grid that allows for this flexibility. Therefore, depending on screen resolutions, the website dynamically alters to fit the device and present legible information. Want a live demonstration of responsive web design? 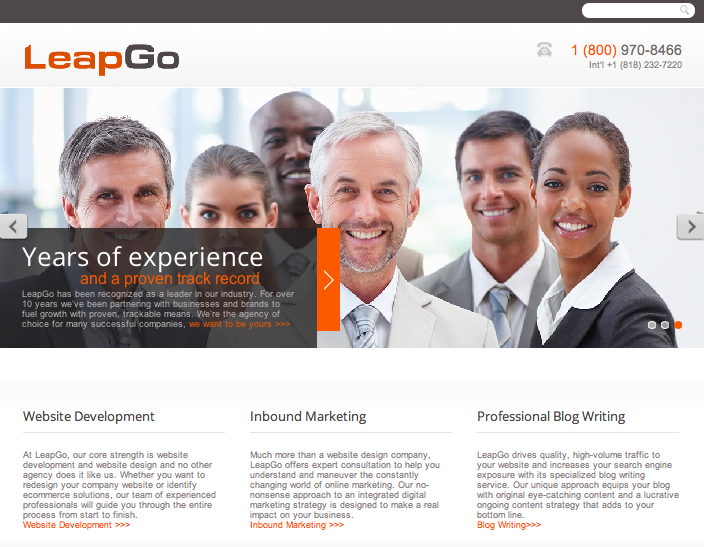 Test it on our website, www.leapgo.com! First take a look at our website on a standard desktop or laptop computer. Then bring it up on your smartphone or tablet and see our website in action. See how it works and looks great on every screen? Here’s another demonstration. Bring up our website on your computer. With your mouse, alter the screen size horizontally or vertically and see what happens to the text and images. Same website, different layouts based on screen size and fluid movement the whole time. Now try it on your own website. If your website is not responsive, it will be immediately obvious; little will change and you’ll have trouble seeing and reading it. If your website is responsive, you might notice changes occur similar to LeapGo’s website. Maybe the images in the sidebar disappear, the columns shrink as text begins to wrap, and the screen features a single column of information. If your website is responsive, you also probably noticed that some above-the-fold content disappeared while the rest stayed. 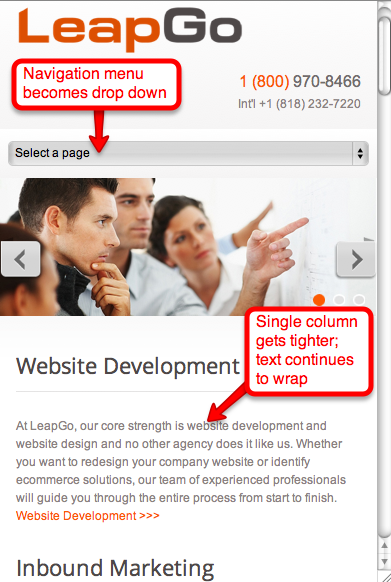 That’s the biggest challenge of responsive web design: prioritizing content. As your screen goes from big to small (or to a smaller device), you need to make sure your most important content remains at the top and shows up first. When your eye-catching copy, latest promotions, top products, or new videos disappear or fall to the bottom, you lose that pivotal user experience that you tried so hard to create. It may take some experimentation, but you’ll eventually strike the right balance regarding content hierarchy for all devices. By making your website responsive, you’re satisfying the needs of all your customers no matter what device they use. You’re giving users the proper website experience without, for example, forcing them into a mobile site while they’re on a tablet (trust me, it’s the worst!). When your website is easy to read and follow, your customers are more likely to stay on the page, explore your content, and make a purchase or booking. It’s an easy way to boost satisfaction and increase sales at the same time. While responsive web design is still in its infancy, it’s becoming more important by the day. Enabling this functionality for your website now will help your business profit in the long run. 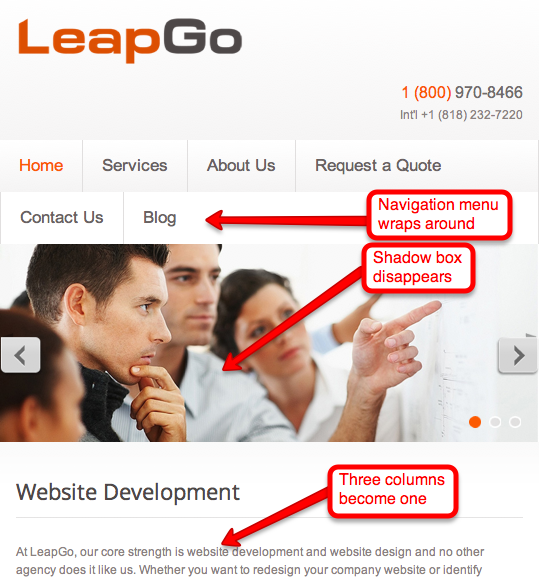 That’s why if you’re going to give your website responsive design, leave it to the experts. LeapGo is one of those experts. Request a quote and we’ll be more than happy to develop your website with responsive design in mind.